Our most popular ski resort Bansko has comfortable and safe lifts, from which the guests of the town can benefit all year round. The residents and visitors of the resort can use two six-seat lifts, 6 four-seat lifts, 2 two-seat lifts and one cabin lift, which is the most attractive and preferred ski lift in Bansko. 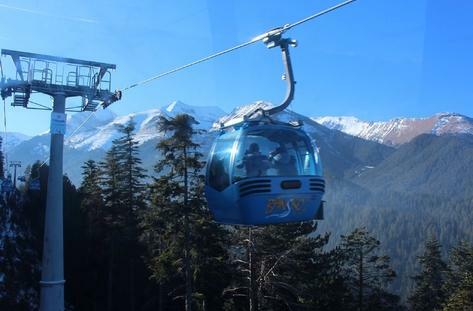 The cabin ropeway „Bansko-Banderishka polyana” has a length of the route of 6233 meters, which ranks it second in length. (The champion is Simeonovo ropeway in Vitosha Mountain, which is with length of the route of 6720 meters). „Gondolata”, as they still call the Bansko cabin lift was manufactured by the Austrian company „Doppelmayr“ in 2002, (today‘s Austrian – Swiss company „Doppelmayr-Garaventa“) and it was commissioned in 2003. The route through which the lift passes is with displacement of 597 meters, and the capacity of the facility is about 2000 per hour. The stations of the 8-seat cabin lift Bansko are three – lower (initial), intermediate and upper (final). The lower (initial) station is located at an altitude of 998 meters, about 2.5 kilometers away from the center of the resort town. The distance from one of the most attractive and popular hotels in the town – Lucky Bansko to the initial station of the cabin lift is about 1.6 kilometers, and during the active ski season the hotel offers to its guests free transportation to the station every thirty minutes. At the lower station of the lift are located the ticket-offices from where you can buy the tickets and cards for the lift. The ride from the initial to the intermediate station is very pleasant and comfortable, and the views that are revealed before the eyes of tourists are unique. Wherever you look, everything is beautiful, calm, and with every meter up in the mountain the accumulated stress reduces and remains somewhere far behind. The route passes over high, centuries-old trees, big meadows, rivers, bridges and the sun touches the tops of the trees and playfully makes a „Rabbit”. So imperceptibly, comfortably seated in the „Gondolata”, you find yourself at the intermediate station. The intermediate station is located in the „Chalin Valog” area at an altitude of 1468 meters. Here the tourists have two options – either to get off the lift and take a walk or slope down the ski runs of „Chalin valog”, or they can continue to the upper station of the lift. If they choose to get off at the intermediate station, the tourists can take a walk and have a great one-day summer trip with a picnic at „Chalin valog”, and if they visit Bansko during the active ski season, they can slope down on one of the four ski runs that are located in hte area. The ski runs of „Chalin valog” are not difficult and they are preferred by the beginner skiers. 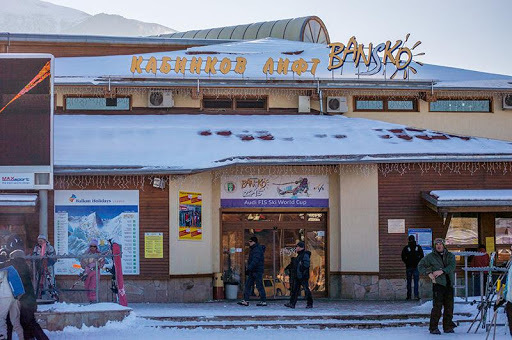 If the tourists choose the second option, it is not required to get off the lift and transfer, because the Bansko cabin lift is one of the few in the country where the cabins are taken by a second rope, which allows transfer without the need to get out of the cabin. The last part of the cabin lift route starts from the intermediate station „Chalin valog” and ends at „Banderishka polyana”. The area „Banderishka polyana”, where the upper (final) station of the cabin lift is situated, is one of the most attractive places for summer and winter tourism in the Pirin Mountain. From Banderishka polyana (1595 meters above sea level) starts every new ski season in Bansko, and during the summer there are held various competitions and other social events, as the sights that are revealed to the peaks Vihren, Kutelo and Cherna mogila can‘t be ever forgotten. The attractions located in close proximity to the station „Banderishka polyana” are, as we have already mentioned, both summer and winter. In the winter season from Banderishka polyana the lovers of the ski slopes can slope down on the ski run Banderitza, which is with length of 4860 meters and is of medium difficulty. The ski run is suitable both for beginners and for more advanced skiers, and it provides many opportunities for the ones who want to test their abilities.The continuations offered by Banderitza for slopes are the ski runs Todorka, Alberto Tomba, Balkaniada and others. In the summer, Banderitza offers a great variety of attractions such as the biggest water slide with length of 400 meters (the longest in Europe), shooting ranges, mini golf course, football with small loopholes and others. Apart from the countless attractions, on the territory of the area there are many restaurants that offer the traditional cuisine of Bansko. From Banderitza start many eco and bicycle routes, also from there you can begin climbing the peaks of Pirin Mountain, and you can have a walk to some of the popular lakes and so on. 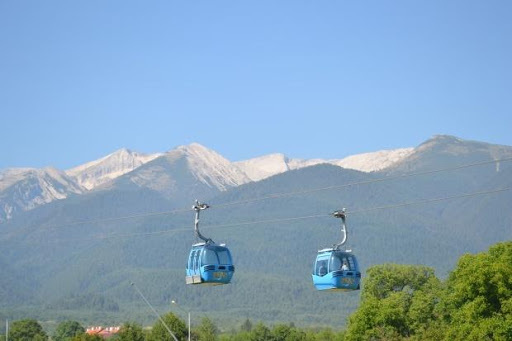 The ride with the Bansko cabin lift from the initial station to Banderishka polyana takes about 20 – 25 minutes at an average speed of 6 meters per second. (This is the set speed of the lift, which, however, can be changed depending on the load, metrological conditions or the discretion of the technical personnel to increase the safety of the passengers). The length of the cabin line from the initial to the intermediate station is 3318 meters, and from the intermediate to the final station is 2915 meters. from 25.09 to 30.11.2018 the working time of the lift in Bansko is during the entire week without Saturday and Sund At 08.00 h in the morning the lift goes up from Bansko and at 16.30 h it goes down from Banderishka polyana to Bansko. Two-way ticket for adult is 20 BGN, for students/pensioners – 18 BGN, children from 7 – 12 years – 16 BGN, for children up to 7 years – 1 BGN. One-way ticket for adult – 16 BGN, for students/pensioners – 14 BGN, for children from 7 to 12 years – 12 BGN, for children up to 7 years – 1 BGN. The tickets for cyclists are as follows: 30 BGN for adults, the students and pensioners have to pay 27 BGN, for children from 7 to 12 years the price of the ticket is 24 BGN, and for the little children the ticket is 1 BGN. The two-way ticket for the cabin lift can be used within a day (uphill and downhill) or to different directions in different days (for example, one day the direction is uphill, and in some of the next days, the direction is downhill). *During the ski season, the working time and prices of the cabin lift are subject to update. How to reach the lower station of the lift? As the lower station of the Bansko cabin lift is located at 2.5 kilometers away from the town, the options to get there are by walking, by your own car or by organized transport. As we have already mentioned, the guests of hotel Lucky Bansko have the benefit to use the service offered by the hotel, namely free transportation to the initial station of the lift, which is available every thirty minutes. Very close to the last (upper) station is located the Banderitza hut, and anyone who wishes to visit it can do it. The hut has 95 beds, canteen and touristic cuisine. There is an option for accommodation both in private rooms and in common tourist bedrooms. From Banderitza hut start many hiking routes as the most popular of them are close to the Vihren hut (half an hour walking), Vihren peak (3.00 h of walking), Kazana shelter (2.00 hours) and others. About 200 – 300 meters from the hut is located one of the greatest sights in the region of the resort town – Pinus leucodermis /Baikusheva mura/. This centuries old tree is only 10 minutes away from the hut and it is really worth seeing. The 1300-years old coniferous tree is the oldest tree of this pine type, it is named after his founder Kostadin Baikushev, who discovered and described it in 1879. The tree is 26 meters high, its circumference is 7.80 meters, and its diameter is 2,48 meters. This natural sight can be seen from afar and it is one of the most visited landmarks in the country. The ride with the Bansko cabin lift is a great experience for both children and adults. The areas over which the route passes are incredibly beautiful, the sights – unique and picturesque. No matter whether you will take the lift in summer or in winter, you won’t be disappointed by the ride. Within 25 minutes you will forget your daily problems, you will recharge your energy and you will enjoy every moment. You will pass over centuries old trees, over moraines, over meadows and rivers, and there – right in front of you, the majestic peaks of Pirin Mountain will be waiting for you to slope down.